In the wake of the modern world, information became available for everyone, whether it was in the smoking clubs of the aristocracy or in the crowded working class pubs after a grueling shift in the factory. In the 19th century, the newspaper allowed everyone to get a grasp of what was going on in a time of dwindling empires and rising nations, a powerful tool to bring the truth to the populous- or to twist it in the most convenient way to reach one’s goals. 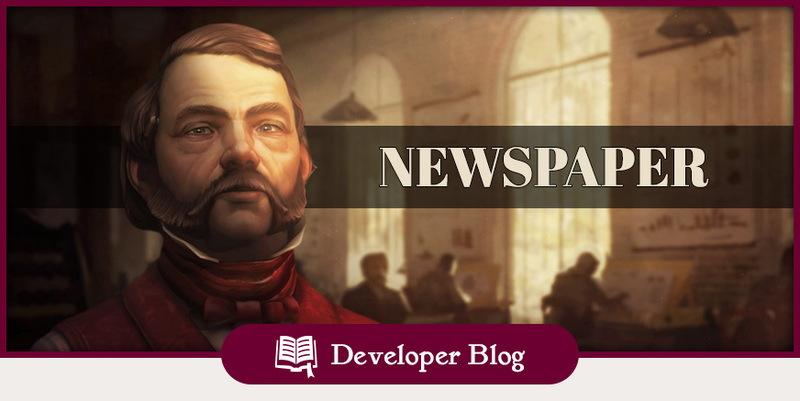 The newspaper is a new addition to the game, which not only highlights the milestones of your empire but also looming issues in your ever growing city. It’s a flavorful tool which helps newer players to understand what’s going on while Anno veterans have a satisfying stage to showcase their big achievements (or being reminded of their failures). Reading the headline “grand opening of the wondrous World Fair” or the shocking news about an outbreak of war also helps to immerse yourself in Anno 1800’s colorful but often dramatic setting of the 19th century. 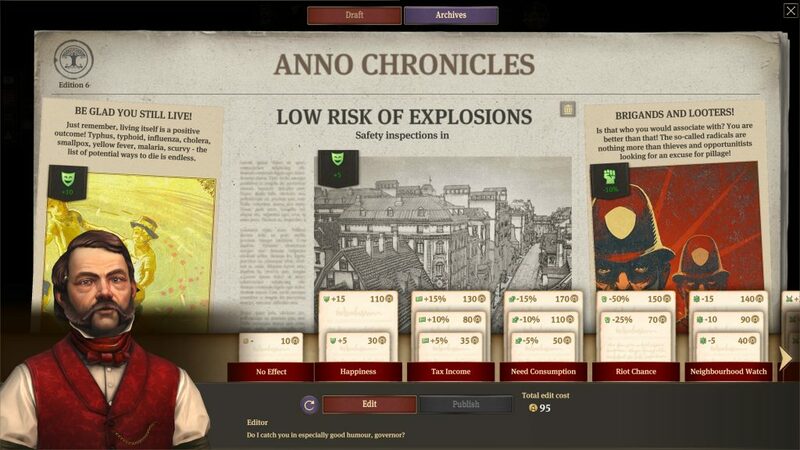 The “Anno Chronicles” keeps track of everything noteworthy happening in your city, both good and bad, and will highlight the top three news on the front page of every new issue released. And as your residents are always eager to get the latest rumors, word of a beer shortage in your city can spread like wildfire, affecting the happiness of your entire population. In the same way, news about your newly opened school will have a positive effect on the mood in your city. With that, news can have either a positive, negative or no effect on your city, depending on the nature of the event. While ravaging fire is naturally makes for a menacing newsflash, the other two articles can also generate positive effects, if there is something positively exciting to report. The range of possible positive or negative effects of the newspaper on your city includes happiness of your population, consumption of goods, the chance for a riot and taxes gained from your residents. Once an issue is published, the global buff or debuff on mentioned categories can last up to an hour. 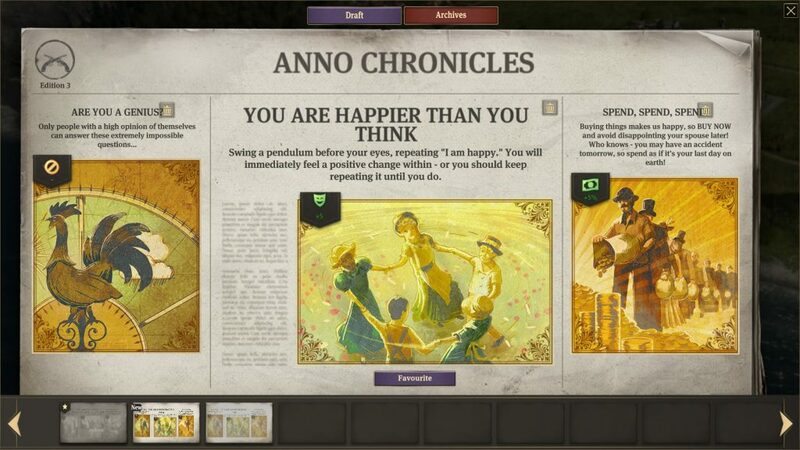 The system tracks all important milestones of your empire, with usually one issue of the Anno Chronicles being published roughly every 30 minutes, reflecting the actual development of your metropolis. But if dramatic incidents happen, such as a sudden declaration of war from your neighbor or your first expansion into the new world, the newspaper won’t miss the chance to publish a special issue to cover the breaking news. Furthermore, as old news become less interesting for the esteemed reader, ongoing issues will lose priority over time. As an example, the scarcity of bread is surely a matter people care about but they can get used to it, especially if there are more emergent issues on the horizon. That way, the Newspaper always ensures that you get interesting and not overly repetitive news. As you can imagine, a well-developed empire will give your newspaper plenty to work with. And should there ever be a time where nothing noteworthy has happened in your city, your always-reliable editor will back on his stock of humorous anecdotes and filler stories. In total, we have prepared a total of over 250 possible articles, ensuring that the release of a new issue of the Anno Chronicles always makes for an entertaining diversion. On top of that, all published articles will get archived which allows you to browse through the history of your empire. The newspaper is interested in the latest rumors and breaking news, which can be rather inopportune to a besieged ruler of a troubled empire. Thankfully, there are ways that you can make your influence work in your favor, persuading the editor to instead publish some alternate, more helpful news- all for the greater good of your island, of course! Enforcing propaganda allows you to change or erase unloved articles by temporary spending influence points. But backing your editor into a corner will not only let you get rid of the thorn in your side, but also benefit from some of the positive buffs that propaganda can (temporarily) apply to your city. The different propaganda articles vary in strength, effect and influence cost. There is also a progression curve attached, with more effective articles becoming available as your empire and company level grow. While standard articles have only a limited amount of effects, we have a total of 9 different positive propaganda buffs which additionally come in three different levels. And with that, taking control of the newspaper can have a high impact on your economy and other game elements. From simple announcements, which erase negative news articles up to morale boosting propaganda which lowers the riot chance, reducing the consumption of certain needs or improving your tax income. During an island siege, propaganda can unfold its real power of influencing your residents. Use war speech to make your people less willing to surrender during a siege, mobilize your workers to speed your military production or encourage your soldiers to increase the firing rate of your harbor defenses. But spending influence is not the only downside, as some propaganda articles might have additional negative effects on your empire or on the standing with other third party characters. Depending on their nature, they might dislike the idea that you manipulate your people; other NPCS, who themselves are not opposed to exploiting their citizens, may however feel attracted by such behavior. But times have changed and your residents might not be willing to belief every news article you feed them as they might be able expose your web of lies. The more propaganda you use, the higher the chance that riots occur as residents refuse to accept the manipulative doing of their leader. However, education plays a role in looking through your deception, so higher tiers like the engineers will be more likely to look through your lies than the more humble farmers. In that scenario, it can even happen that a propaganda article you use increases the overall happiness of your islands while the engineers rally on the streets. We will leave it at that for today, as many of you will be able to get their hands on the newspaper system themselves as soon as tomorrow, when our Closed Beta begins. Until then, we are of course curious to hear your first thoughts about this new system, which can have a profound impact on many other aspects of the game. Is it beta bug or I’m just not getting it? Why it keeps punishing me saying about lack of marketplace but only one piece of the city isn’t covered by marketplaces’ reach is an artisan’s block?!! I mean, artisans don’t require a marketplace, so is it newspaper bug or what? Looks like a brilliant addition to Anno! – Can’t wait till tonight and playing with it! Woo Hoo! I think this is a fantastic addition to Anno! I have seen in-game news papers before in some games. Like Rail Road Tycoon for example. But this news paper system in ANNO 1800 really takes the next leap. It is much more than anything else I seen, and I am really liking this feature. Although I am not a fan of propaganda. As I prefer to remain true to my people, never lie to them, and ensure they are happy. But it is interesting to see how propaganda plays out in the news paper system in ANNO 1800. Like as mentioned, how each residential tier can take the propaganda differently. That really adds a interesting layer, and twist to the game for sure. None the less. I am impressed with the progress the Anno Team has made. I really look forwards to the game. Pushing the release date back seemed to have been a good idea. The game is really taking shape now, and I am excited for the completed product on release in April. I look forwards for the Closed Beta (if I am one of the lucky ones), and if not I will gladly wait for the release. The Anno Team never ceases to amaze me! Keep up the amazing work! The music in the background is fantastic. I love it. The newspaper is a welcoming addition to the game. It makes the game more alive. I like it that changes can be made to an article.